There are many Andy Crofts. This website is about one of them, a writer and poet who lives in North Yorkshire. He is not an Arctic explorer, an Australian actor, a driving instructor or an evangelical Christian; he is not Paul Weller's keyboard player, he does not play for Norwich City and he is not the distinguished ghost writer Andrew Crofts (although he has written a novel called Ghost Writer). But this Andy Croft also has several lives. He has been persuaded to put together this web-site in order to bring together some of the different kinds of writing projects in which he has been involved. Andy Croft was born in 1956 in Cheshire. 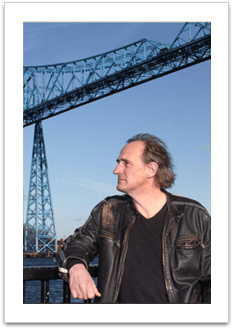 He went to Nottingham University and taught Literature and Creative Writing for Leeds University's adult education department, in Middlesbrough from 1983-1996. Since then has made a kind of a living as a writer. He and Nikki have six children and two granddaughters.